I am almost reluctant to share this secret local spot, because somehow until now it has remained hidden in plain sight to visitors streaming past in surrounding streets right in the heart of Madrid. 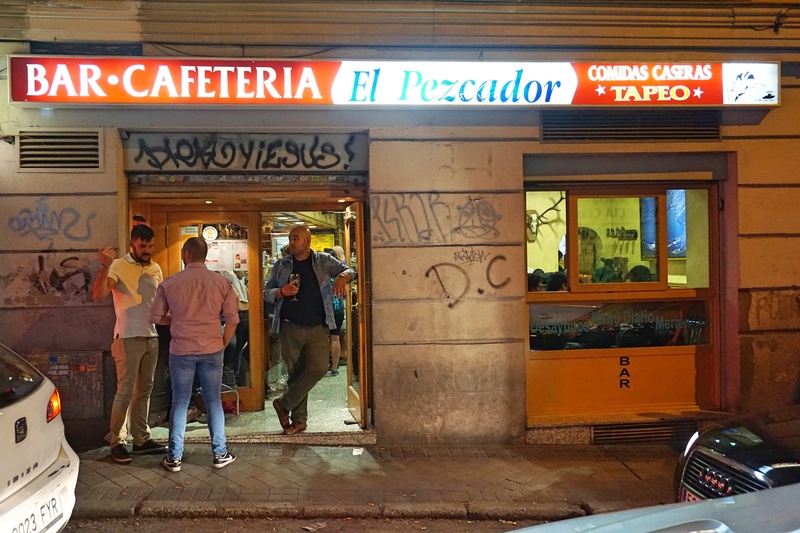 Yet at the same time it is too good to keep secret – I’m simply too riveted by it to not share with you my experiences of El Pezcador and Spanish Tapas culture. The first time I had tapas was probably a little over eight years ago. I had gone to Madrid to take a Spanish course for a couple of weeks during the summer. If you’re thinking of traveling solo, enjoy learning about new cultures and like the idea of making friends from different parts of the world, I cannot recommend enough taking such a language course. You’ll have local teachers to give you all the non-touristy recommendations, and non-local fellow students to discover them with. And sometimes you may even mingle with locals when you’re out trying tapas and other specialties of the region – which is how the group and I came to experience tapas, you guessed it, the local way: in a bustling bar filled with loud chatter, floor covered in thrown-away tissues, drinks ordered that are served with surprise tapas that never disappoint in quality nor taste. Receiving free tapas with your drinks is not something that you can expect in any locale in any part of Spain. Even in Madrid you need to know where to go in order to benefit from this custom. And yet the fact that such a practice exists is amazing to me – precisely because it is such an ordinary everyday thing for locals. Imagine you could go to a pub in London, or a bar in New York, or any drinking establishment in any other part of the world, wherever you may be, and order a drink that comes with a plate of delicious food. Having said that, there are places in the world where this is not unusual, South Korea and their anju drinking food being only one example. But different social contexts have led to different cultural developments. What are tapas anyway? There exists a clear dictionary definition, which describes tapas as a small portion of food accompanying a drink. Usually these will consist of savoury hot or cold bite-sized appetizers or snacks served or had with drinks. It is in fact a very broad description for the plethora of forms a tapa can take. What all these have in common is that they are usually a few mouthfuls, because a bigger portion will be called media-ración (half-portion) and an even bigger one simply ración (portion). What also makes them tapas, as opposed to just food, is the commensality surrounding them. Technically, of course, you can enjoy tapas on your own, but what really brings them to life is the conviviality they encourage in sharing and taking one’s time to rejoice in the food, hopping from one tapas bar to the next in pursuit of the latest tapas concoction and more quality time with friends. This culture of bar-hopping is so ingrained, that there’s even a noun and a verb for it: tapeo and tapear, or ir de tapas. Specifically, they refer to the custom and practice of moving from bar to bar to try more tapas with your drinks. It was not before the late 1930s that the word tapa was even included in the dictionary of the Real Academia Española. However, it was still regarded as nothing more than an Andalusian dialect. Only from the 1970s onwards was it treated as a culinary concept of the whole of Spain rather than as a mere coloquialism. Fascinating to see then how, in less than a century, the word tapa as officially denominated in the dictionary developed offspring in the form of verbs and a further noun. Of course we have actual language users to thank for this, and the vibrancy and everydayness of the tapas culture, which enabled new terms to emerge. In that way tapear, salir or irse de tapas means more than simply having food with drinks in several bars during one night. It’s about taking pleasure in the tapas and drinks not alone, but with friends, about food as both a means to an end (spending time together) and an end in itself (the enjoyment of it). More than anything else, it’s the concept of sharing tapas with a group of people, the aspect of commensality that makes tapas tapas. They are an opportunity to relax after work and have an entertaining night out with friends. Since bars are often busy and the regular occasion of having tapas is quite informal, the feeling is one of noisiness and conviviality. Tapas are commonly ordered at the bar together with your drinks, rather than from a waiter serving tables. They are also best had standing up at the bar, at high tables, or even at upturned barrels. This practice of eating small morsels of food while standing even has a name in Spanish, and it’s called picar – to pick at something like a bird would do. Compared to more traditional meals, tapas are usually lighter, cheaper, easier to prepare and allow for a great variety of food in one sole sitting, as well as for more socialization encouraged by the sharing of foods and the long night spent together hopping from one bar to the next. Sadly, more than the actual food, it is often the concept, practices and traditions around it that travel the least. It is a reality which can be easily explained, because our practices, more than the products surrounding us, are the ones that are most deeply ingrained in our culture. The beauty of tapas, specifically as they can be had in Spain, is that they allow you to try many things even in one night. They set the scene for a chatty, relaxed and commensal atmosphere. And this culture of trying out several foods not only in one night but also in several locales has allowed for a regional and also personal chef creativity to blossom. There are a plethora of different tapas according not only to region, but also depending on the individual bars and chefs. Classics have developed that can usually be found all over Spain, such as olives, tortilla de patatas, jamón iberico, anchovies, patatas bravas, calamares (squid), croquetas, and the list goes on. But these most commonly found tapas only whet the appetite for what seems like an infinite variety. In many Spanish provinces it is common to serve small cold tapas without any bebida (drink), because it is known that these will likely incite thirst and thus lead to the ordering of a beverage. Only in a few provinces such as Segovia or Cáceres are warm tapas a must for the innkeeper to serve. Quite commonly a local bar or restaurant will have a dozen or so different kinds of tapas in trays with glass partitions to cover the food. Customers can choose from these or any other items on the menu that are prepared back in the kitchen. “Tradition” is a weighty word, and may easily exclude equally valid ways of doing things by delineating what can or cannot be considered a long-standing practice or belief. While it is hard to tickle out the way people enjoyed tapas many centuries ago and what tapas even meant to them, we can be sure that since the time tapas started developing, many things have changed, and not everywhere (in every region, in every family, etc.) in the same way. Whether certain current practices have been around long enough to be called tradition is not my concern here. But the fact that many people refer to them as such and live by them, makes it interesting and valid enough to mention to you here. Tapas are commonly made with Mediterranean ingredients such as olive oil, shellfish, squid, garlic, and so on, but of course there exist variations, especially in more internationally influenced creations. It is said that the custom used to be to have tapas before lunch, but this has now extended to dinner and a replacement thereof, since with all those rounds the tapas served are more than enough to satiate one’s appetite and thus make up the main meal. Nowadays then, the typical time to have tapas, when the kitchens are open, is between 1 and 4pm during the day, and from about 8 or 9pm until 11pm or 12am at night. You will find that in some places, especially smaller towns, it will be difficult locating a good tapas bar or restaurant during the normal break hours between 4 and 8pm. Because ir de tapa is often a very spontaneous activity, reservations are rarely made, and you usually wouldn’t have more than two tapas in one place before moving on to the next one. That’s also why locals often don’t split the bill. Rather, one person will pay for one round, then another person in the group for the next. Sevillans even have a name for this and they call it la convidá. Again, if you’re from Korea or you’ve experienced the local Korean way, you will have come across this same practice. As previously mentioned, it is only in the most traditional tapas bars in the most traditional regions (eg Andalucía) and cities (eg Madrid) that you receive a free tapa with the price of your drink. 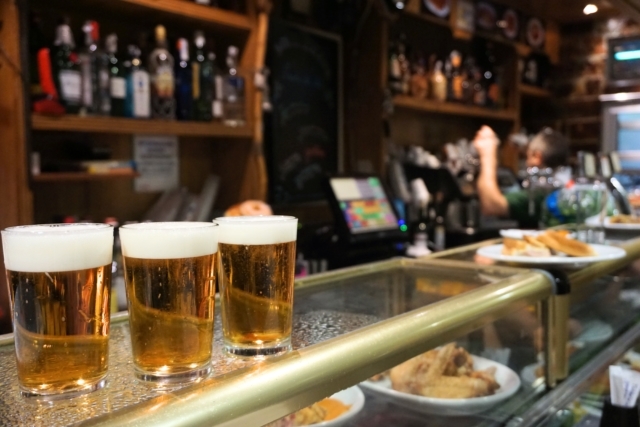 The custom of receiving a free tapa with your caña (a small glass of beer), copa de vino (a glass of wine) or other drink can also be found in cities such as Granada or Almería. In the latter tapas can even be chosen and are served without limit. So how did the current custom of tapas actually come to be? Indeed, there exist a considerable amount of tapas origin stories, which have become part of the common Spanish folklore. While they may be no more than fiction, or only a small part of truth at best, they make for an engaging oral history that enrich the whole cultural tradition of tapas. Keep on reading for some of the more popular ones. It is recounted that in the 13th century, due to an illness king Alfonso X el Sabio was suffering, he was ordered to have wine regularly as a remedy. To dampen the effects of alcohol he would have morsels of food with his wine. Enjoying this way of life, he decreed upon his recovery that all drinks in taverns and elsewhere should be served with a small snack, or tapa as we call it today. Another legend tells the story of a law that was put in place during the reign of Catholic Kings, which required taverns to serve any alcohol with a small plate of food on top, usually cold fare such as ham or cheese. Patrons would have to eat the food before they could drink the wine, with the aim of reducing their state of drunkenness when they left the tavern. Then there is the delightful piece of folklore of king Alfonso XIII who, during his stay at the El Venterrillo del Chato inn in the province of Cádiz, asked for a glass of jerez (sherry) when suddenly a wind swept in, bringing with it the sand, insects and dirt of the surrounding area. The barman hastily covered the king’s glass with a slice of ham to prevent any unwanted substances from entering. This the king liked so much, that he asked for another such drink with a tapa – in Spanish “cover.” This is perhaps one of the most popular stories surrounding the origin of tapas, given the double meaning of the Spanish word tapa. Logically, however, it can be torn apart quite easily – would the king really have enjoyed his drink with a slice of greasy ham covered in dust, sand and other impurities? Another story told that perhaps seems more plausible is one of workers during the 19th century who instead of copious meals had regular small portions of food with a glass of wine throughout the day in order to maintain their strength. A more humble narrative to the Cádiz version states that bartenders at a bar in Sevilla would serve their drinks with a saucer on top to keep flies out, soon realizing that they could use this to also offer some olives, cheese or ham. It was thanks to this unprecedented generosity that customers kept returning rather than seeking out other locales. In a similar vein, there is also the account of tavern owners having invented the concept of tapas out of economic interest. Their thought was that if they offered salty foods such as ham with drinks, patrons would thirst for more and keep sticking around. In a yet more sneaky way, another tale recounts how tavern keepers would cover cheap wine with a plate of strong cheese in order to confuse patrons’ olfactory senses and prevent them from realizing how bad the beverage actually was. Finally, because having drinks in busy bars often involved standing, customers who ordered a snack had nowhere to put their plate except on top of their glass, effectively starting the tradition of tapas. While in truth the development of tapas may have had something to do with a combination of these accounts, it must be fun to pick out a story and pass it on over a glass of wine and a tapa as a little light amusement. Next time the conversation falls on tapas, why not have a story ready? Not yet armed with this folklore knowledge, but having experienced Spanish tapas culture in Madrid before, my partner, our friend and I ambitiously moved from bodega to bodega on our only night in Madrid during our one-week trip through Spain. Tapas bar El Pezcador was our last stop, kindly recommended to us by the cleaning lady at our airbnb accommodation. Had we stayed longer, I would have gone back the next day. Had we known about it sooner (that is, how good and affordable it was), I would have made it the first stop of our afternoon. This because, after a day of food-bingeing, we couldn’t even finish the two plates of tapas that came for free with the six cañas we ordered there. And although the pimientos de padrón (padrón peppers) with chorizo sausage, the pollo (chicken) legs and wings, and the ham and cheese tostada (toast) that we had that night may be screaming out ordinariness to some of you (including me), they were in fact incredibly delicious. If ordinariness is linked to appearance, then these tapas need to be defended. But if ordinary means homemade to you, which to me equals delicious food for a low price, then my, oh my were those tapas ordinary! They were not just packed with flavour, but so incredibly affordable too. Big portions of three different kinds of foods that came with the six cañas we ordered throughout the hour or so spent there. When in the end we received the 11-euro bill, our jaws dropped to the floor. A truly amazing experience and one that I hope you’ll be able to enjoy one day as well. If you’ve gotten in the mood for tapas, why not keep reading and start making your own bucket list for your next trip to Spain. You can find out more about the bombastic La Bomba tapas in Barcelona here. Be prepared for a flavour-intense, explosive tapeo ride!